Pharmalab manufactures Pure Steam Generators to meet cGMP requirements. Condensate of this pure steam produced does meet all pharmacopoeial requirements of WFI like USP, IP, BP and JP. The plant is manufactured as per FDA current Good Manufacturing Practices (cGMP) and ASME requirements. The plant is completely made of AISI 316 L stainless steel with active surfaces electro polished. Double tube sheet for heat exchanger and all pre-heaters. The insulation is made of glass wool covered by AISI 304 stainless steel sheet. All contact parts to WFI are electro polished with state-of-the-art technology. 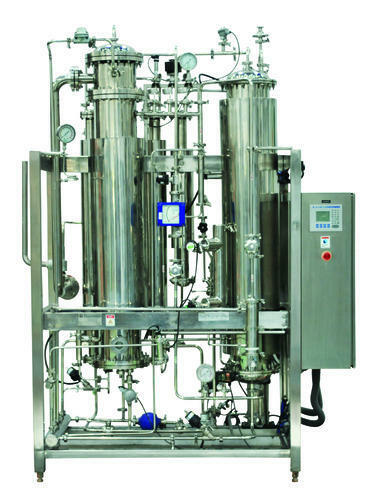 Established in the year 1962 at Mumbai, (Maharashtra, India), we “Pharmalab India Private Limited” are engaged inmanufacturing and exporting the best quality equipments like Filter presses, Filter Housing with different Filter Bags, WFI Generation System, Pure Steam Generators,Steam Sterilizer, Ventilator Sterilizer, Dry Heat Sterilizer etc. We export our products to Africa, Europe, South East Asia, USA, Latin America, Middle East, Russia etc.